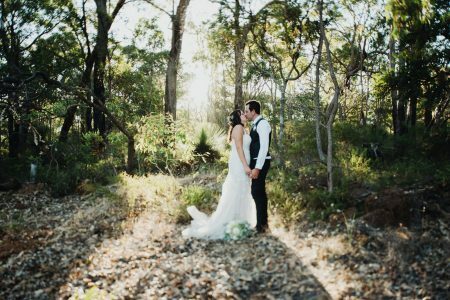 Dannika & James traveled down from Perth to Margaret River and I was lucky enough to film their wedding day! 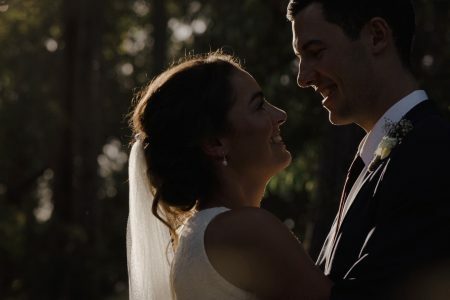 Their ceremony and reception was held at Heronsbrook Estate, a family owned property in Margaret River with horses, lakes, streams, an olive grove, and plenty of native bush. James arrived by boat to the lake side ceremony next to the Gazebo. 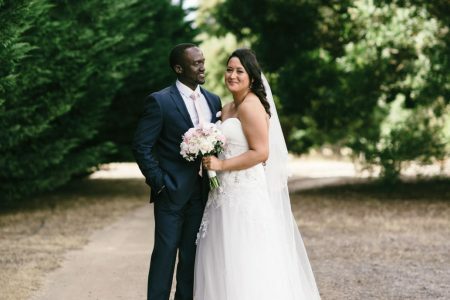 The bride arrived looking absolutely breathtaking in her Paolo Sebastian bridal gown, walking down the aisle with both her Mum and Dad by her side. She designed her own duster for getting ready in as well as her own reception gown for dancing in. Natural Art Flowers by Rebecca Grace produced stunning floral arrangements and bouquet. The weather was perfect for an outside canapés area, live music and a dancefloor beneath the stars where Dannika and James performed their choreographed dance. James and I met over 10 years ago through mutual friends in Perth but it wasn’t until 2 years ago that we crossed paths again. We were together for about a year when James proposed and we were married 11 months later! We love to travel and in the passed two years we have visited 9 countries and 25 cities. We have a tubby chihuahua called Hemingway, spend a lot of our spare time in Margaret River (being outdoors in nature or at the beach; always drinking wine…), and love exercising (morning runs in Cottesloe followed by a swim at the beach). We were holidaying in Japan; it was Christmas Eve and we were out sightseeing (hedgehogs) in Tokyo when we had to rush back to the hotel for an “urgent work matter”. When we arrived back at the hotel James said, “you’ve got 10 minutes to pack your bag for a surprise”. We were whisked off to a beautiful suite at the Peninsula Hotel overlooking the Imperial Gardens where James popped the question as soon as we got in the room. A bit nervous I think! It turns out Christmas Eve is Couples Day in Japan, the equivalent of our Valentine’s Day – a very popular day for proposals so there was a bit of a wait to get champagne!